HA HA HA, I am such a geek! Look what I managed to get my greedy hands on! These toys were produced, but the line was discontinued before they were put on the North American market. Booooh! So now, gotta hunt them down everywhere else in the world that managed to get a shipment. And, since they were discontinued, quality control on the packaging was sometimes...lacking. I doubt these will ever be collectors' items, so I will feel no guilt at taking them out of the box. Oh sweet! And oooh, Zuko pink is your color. lolol! Pink is Ty Lee color - no one will take Zuko seriously with pink! I've never seen anything Avatar related in Spain!! But now that you say that there are some of those jewels running unnoticed I'll open my eyes!! 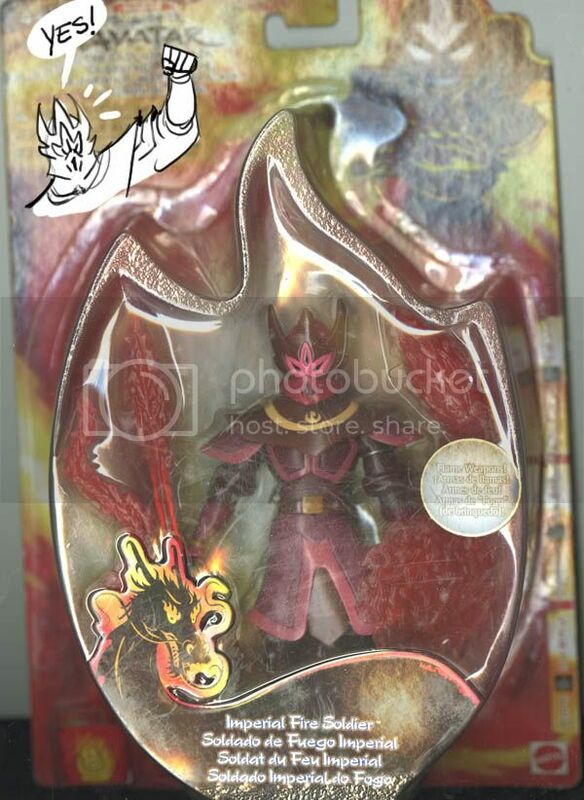 So far, the fire line of toys have been spotted around China (Hong Kong), Japan and Brazil. Still waiting to see if they pop up anywhere else. They may be in a dark warehouse somewhere in North America, waiting for some retailer to by them out of oblivion. THAT'S WHAT THEY LOOK LIKE!! lol, why do they have experimental packaging on sale in other countries? my dad works for mattel so i see it all the time, its usually just spare cardboard they have lying around, thats historical that they actually shipped stuff like that. The only reason I could think of was that since the line was discontinued (at least in North America), what is out there may be whatever was left, including experimental packaging. 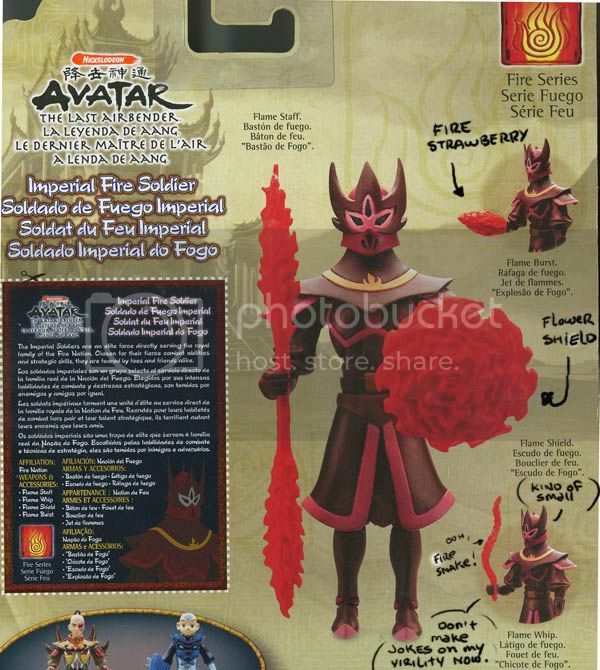 In any case, the pink stuff makes me want to keep the Zuko box. Priceless! Ever since someone pointed out the ressemblance, that is all I see. 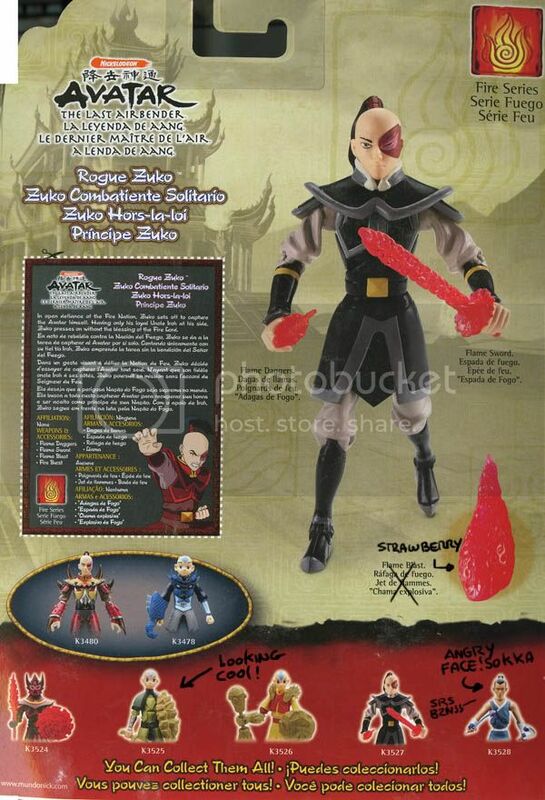 loll yes fire strawberry XD XD Now you can make naughty scenes with Zuko and Zhao in the comfort of your own home! Naughty scenes, involving fire strawberries. Imperial Soldier with flower shield is precious. At least his fire staff is bigger than his fire whip. There was a binder of unused toy designs in on of the creative departments around the office. It was fun to look through and see what crazy ideas people dreamed up. Aw man, that would have been awesome to see!! I can just imagine the stuff they worked on, having seen binders of that type for other projects. So hot, they use them to attack people with! Pink with butterflies because they knoooow Zuko has fangirls!!! 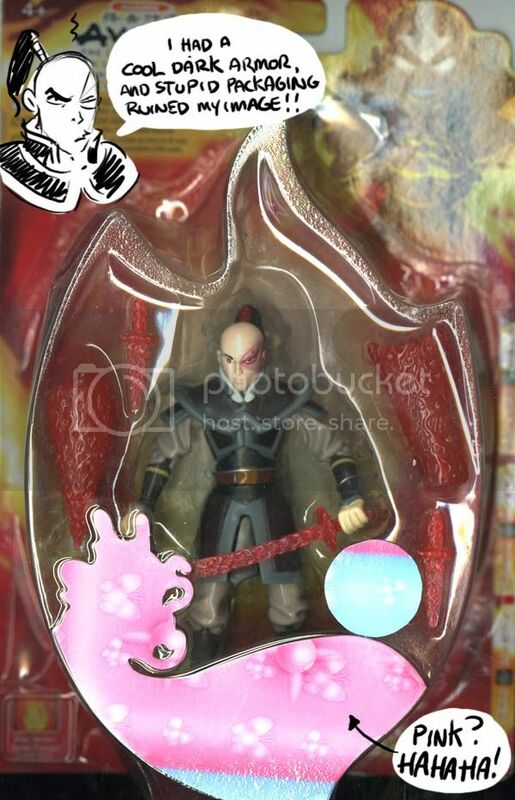 We may not have any girl action figures, but we have Zuko with pink butterflies. *still miffed over the lack of a Katara figure* I could have played out Zutara reenacted important scenes from Avatar with her as I already have Zuko, Aang and Sokka. Gotta remake Avatar without the girls. Or have some of the boys play the girls' role. Once in a while...I just can't resist! There's an Ozai figure out there. oh god LOL not only is it pink, it's clearly part of some other package altogether xD. As someone above mentionned, sometimes they do experimental packaging using unused pieces of cardboards. This one happened to be pink with butterflies. Since this is a serie that got discontinued, looks like even the experimental packaged ones are out there. First, his honor and 25% of his good looks were taken from him. Now his likeness has been desecrated with strawberries. But they are fire strawberries! It must count for...nah, you're right.